As the 2019 general elections is getting closer the candidate of the Action Peoples Party for Ife North State Constituency of Osun State House of Assembly, Prince Debo Odesola has revealed his agenda for his constituents and vowed to abide by it if given the opportunity to represent them. The document tagged "My Commitment to Ife North Constituency and Four-Points Agenda of Peace" was released on the to the newsmen on Thursday and has accountability, empowerment, communal peace and good representation its driving forces. "As a good representative who gets to the power with the mandate of the people especially the electorates, such person must always seek the interest of the community and the people he represented since they are the custodian of power ad and be the representative hold power in trust for them. "On that note, I, Prince Debo Odesola promise to seek the goodness of the people of Ife North Constituency, represent them well and bring dividend of democracy to their doorstep if they give me their mandate and vote for me as member house of assembly representing Ife North Constituency. 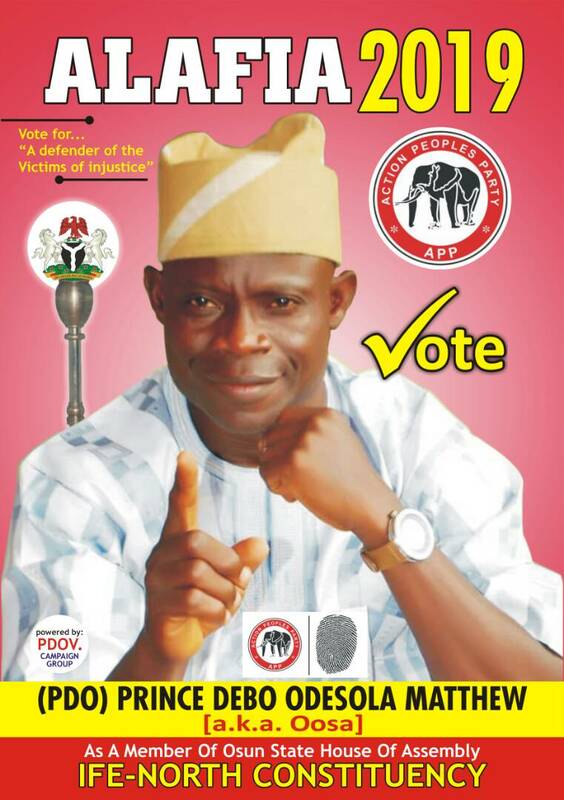 Ife North Constituency deserves good representation in Osun assembly. Let us wake up and put a square peg in a square hole. I remain committed to the development and people oriented projects if the people vote for me as assembly member. "In order not to deviate from legislative duty in the house of assembly and to reach out to my people who gives me their mandate, I will work on four [4 ] agenda tagged "Agenda of Peace". In ensuring accountability, Odesola promised vowed to the electorates that he will make good account of his stewardship by holding regular meetinh with the community leaders and ensure transparency at all levels while he will remain closer to the people too. While revealing what he has on empowerment, the candidate stated that he will work achieving this by creating a scholarship scheme through sports, how creation, computer training and disbursement of food items to aged individuals in the constituency. The document added that he will work hard towards putting an end to communal crisis within the constituency by putting in place legislation that will ensure that all parties have fair deals. Odesola also promised to make himself available for regular meeting with the traditional ruler, opinion molders and chiefs in the constituency in order to entrench the peace. "Above all, if the good people of Ife North Constituency cast their vote for me as their representative at the state house of assembly, am going to responsible to them in all political and social life and prove myself worthy of the votes. "I strongly believe that the people of Ife North Constituency can do it for . Let us be part of history,God bless you all," the document concluded.